[x] Super easy to implement page view controller with indicator bar. [x] Simplistic, yet highly extensive customisation. [x] Full support for custom components. [x] Built on a powerful and informative page view controller. [x] Header scrollable, if the width of buttons is larger than the width of the current view. If you prefer not to use either of the aforementioned dependency managers, you can integrate LZViewPager into your project manually. Just copy the following 3 files into your project. 2) Drag a UIView into ViewVontroller’s view and set it’s type to LZViewPager, then set an outlet variable as "viewPager"
@IBOutlet weak var viewPager: LZViewPager! 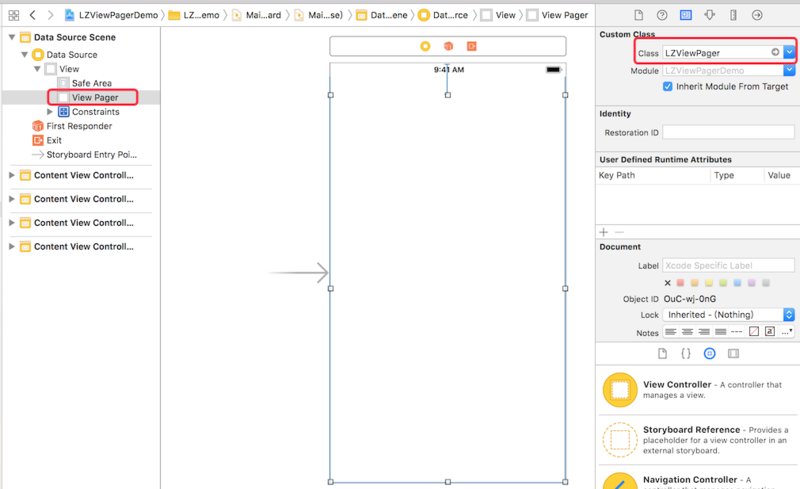 let vc1 = UIViewController.createFromNib(storyBoardId: "ContentViewController1")! let vc2 = UIViewController.createFromNib(storyBoardId: "ContentViewController2")! let vc3 = UIViewController.createFromNib(storyBoardId: "ContentViewController3")! let vc4 = UIViewController.createFromNib(storyBoardId: "ContentViewController4")! When your datasource changed you should call reload() method to refresh. If you want to locating to some page programming you can call select(index: Int, animated: Bool) method, It is important to note that animated is an optional parameter in order to be compatible with the previous versions. If you do not specify animated, it is true by default. If you are encountering issues with LZViewPager, please raise an issue. Logo was designed by Tobaloidee. Bug reports and pull requests are welcome on GitHub at https://github.com/ladmini/LZViewPager.